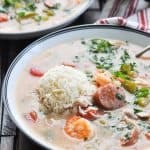 A big pot of Healthy Slow Cooker Gumbo with chicken, sausage, and shrimp is a nourishing, cozy and satisfying way to end the day. Preheat oven to 400 degrees F. Sprinkle flour in a cast iron skillet or other oven-proof skillet. Bake 10-15 minutes or until golden brown, stirring halfway through. Cool 10 minutes. Meanwhile, cook sausage in a Dutch oven over medium heat, stirring occasionally, for about 5 minutes or until browned. Spray a 6-quart slow cooker with cooking spray. Place chicken in the bottom of the slow cooker; add browned sausage, tomatoes, onion, bell pepper, celery, garlic, bay leaves, Cajun seasoning, and thyme. Whisk together browned flour and chicken broth until smooth. Pour into slow cooker. Stir, cover, and cook on HIGH for 2 1/2 - 3 hours (or on LOW for 6-8 hours). If you're using chicken breasts instead of the thighs, you will likely need to err on the longer side of the cooking timeframes (about 3-4 hours on HIGH or 7 hours on LOW). Stir in shrimp and half of the green onions. Cover and cook for an additional 15-20 minutes (or just until shrimp turns pink), stirring once. Discard bay leaves. Remove chicken from the pot; chop or shred, and return to the pot. Taste and season with salt and pepper or hot sauce, to taste. Serve over rice (or over cauliflower rice) and garnish with remaining green onions and fresh parsley, if desired. This gumbo freezes very well (without the rice), so package any leftovers in an airtight container and keep in the freezer for up to 3 months. When ready to serve, simply thaw in the refrigerator overnight and gently reheat the gumbo on the stovetop over low heat until warm. I kept this gumbo very mild to appeal to my kids, but if you like a spicy gumbo, feel free to add more Creole seasoning and/or hot sauce! Serve the gumbo with your favorite cooked rice, or with cauliflower rice for a lighter option! Nutrition information is for 1 cup of gumbo (not including rice).